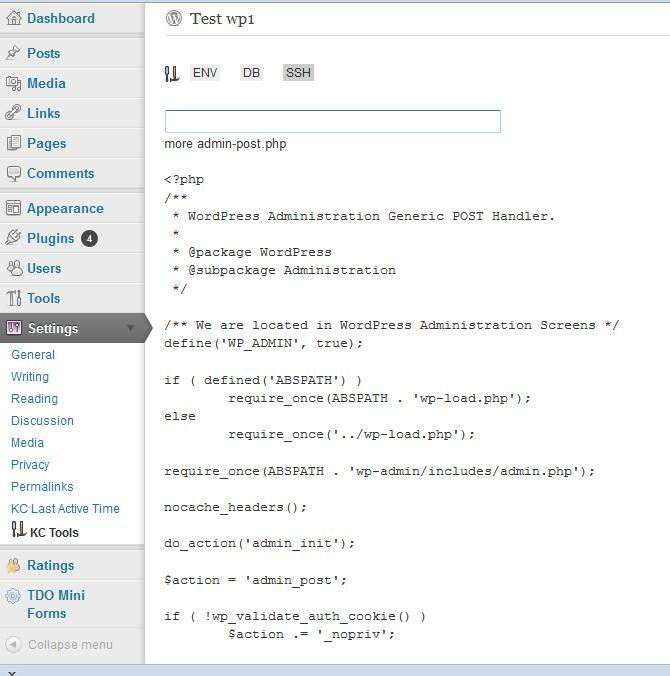 KC Tools is a WordPress plugin with several tools for "in deep" development and troubleshooting. It allows reading of environment info, direct database access and terminal-like interface with server. It is locked by password to your browser only, so you can use it on life sites securely. It do nothing else - no output on pages, no shortcodes, no widgets, nothing, only a new row in "Settings" in Admin area. Sometimes, when develop something new or try to find problem somewhere, needs to read "raw" info. Thus, this plugin is the right tool. But it is too powerful tool, so it is not for everyone. Gurus: It countain 3 tools. 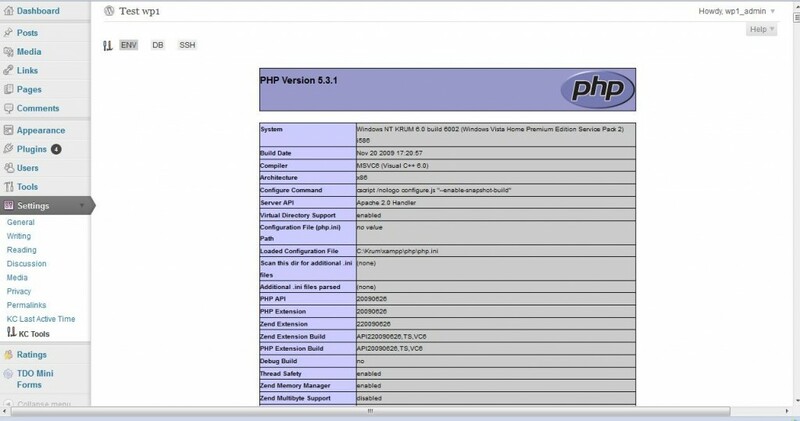 First allows to see environment variables and PHP init settings. Second allows direct communication with database, think about "mysql" UNIX command line tool. It is very light phpMyAdmin. Third is terminal-like tool, allowing command row, almost like SSH, but restricted to HTTPD user rights and no way to run continuous tasks like "top". Also there is more useful tools: formatted debug output (to mail, file and URL), debug shortcode and site wide debug email. There exists a non-WP version too, with more functions. No more Pro version, at 08.08.2016 it was merged with basic version..
5. Click "KC Tools" row in "Settings" within "Admin dashboard". First time you will be asked about password. Ask me, I will answer. Did you have some suggestions? What else you would like to have as tools? Contact me. This entry was posted in KC Tools, WordPress plugins and tagged DB, DB access, developers tools, environment info, hardware info, KC Tools, kctools, PHP info, SSH, system info, tool. Bookmark the permalink.